Late PM Update: Tropical Storm Fay has continued to maintain its circulation over land today; maximum winds are still 45 mph. Forward speed has picked up a little, to 6 mph toward the west as of 5 pm. The edge of the broad center of circulation (not an "eye" in the full sense of the term) was edging back out over water by 7 pm. Bands of strong showers and thunderstorms extend around the center of circulation in all quadrants. Torrential rain has continued for another day. A trained spotter in Duval Co., Florida reported 6" in a 12-hour period ending at 3 pm, with a storm total of 15.47". In Folkston, Georgia the roof of a hardware store collapsed under the weight of 6-10" of water. Substantial additional rainfall is likely anywhere from southern Florida to southern coastal South Carolina. A Tropical Storm Warning remains in effect from Aripeka northward and westward to Destin. Tropical Storm Fay continues its leisurely tour of northern Florida this afternoon, waddling westward at 4 mph; maximum winds remain at 45 mph at 2 pm. The storm is still on track to make a fourth and possibly a fifth landfall on the Florida panhandle. See the previous post for Fay's near-record performance so far. Tropical Storm Fay isn't done with the state of Florida yet, but it's already working its way into the record books. The amount of time it's been sojourning in and around the not-so-sunshiny state raises the question of whether records are being set, and Jeff Masters has some answers in his blog. The 3 landfalls on the state so far make it the first to do so since Donna (1960), shown at the right. Donna went on to make several more landfalls along the Atlantic coast, including North Carolina, Long Island, and New England. A fourth landfall on the Gulf Coast would set a record for landfalls on a single state, and a fifth one is even possible. Tropical Storm Fay weakened somewhat overnight as it slogged slowly westward across the northern Florida peninsula, headed toward the panhandle and a possible re-emergence over the water of the northern Gulf of Mexico. Maximum winds had decreased by 8 am to 45 mph and remained the same at 11 am; little change in strength is expected through tonight. Movement is toward the west at 5 mph from a position about 40 miles northeast of Cedar Key, Florida. A disorganized stormy area about 400 miles east of the Windward Islands: Conditions are expected to gradually become favorable for development. A tropical wave about halfway between African and the Lesser Antilles: Some development is possible in the next couple of days. Latest PM Update: No change in strength or speed of motion at 11 pm. Later PM Update: After apparently overexerting itself, Tropical Storm Fay is back to a more leisurely pace of moving westward at 2 mph as of 8 pm. Maximum winds remain at 60 mph. Update: Added track map, updated race walk speed. The center of Tropical Storm Fay has moved slowly back onshore this afternoon. It's now lumbering westward at a speed barely over half of a race walk, 5 mph. Maximum winds remain at 60 mph, and the torrential rains continue. Because the expected westward track toward the Florida Gulf Coast could bring the center back over water yet again, there is considerable uncertainty in the intensity forecast. A Tropical Storm Watch has therefore been issued for the Gulf Coast from the Suwannee River to Indian Pass. After being nearly stationary through this morning, Tropical Storm Fay is now gradually beginning to move west northwest at 2 mph. At 2 pm, the center was starting to cross the Florida coast near Flagler Beach. Maximum winds are still 60 mph, and tropical storm force winds extend outward up to 150 miles, but mostly east of the center. St. Augustine recently had a wind gust up to 56 mph, however. Image: estimated 24-hr. precipitation from The Weather Channel. 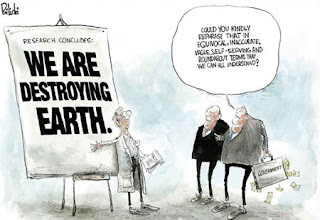 Recent investigations and surveys show that political interference in science has harmed the ability of federal agencies to protect our health, safety, and environment. While guarding against last minute attacks from the outgoing administration, we are building a foundation to guide the next president in restoring scientific integrity to federal policy making. The next president and Congress must renew the independence of science at federal government agencies and create a thriving scientific enterprise. Late, late PM Update: As of the 2 am advisory, Fay is edging northwestward back toward the Florida coast at around 2 mph. Maximum winds remain at 60 mph. Total rainfall amounts of nearly 25 inches have been reported in North Melbourne. Late PM Update: With the center of Tropical Storm Fay hovering nearly stationary off the central Florida east coast, the storm picked up a little in intensity this evening; maximum winds are back to around 60 mph, but the strongest winds are over water. 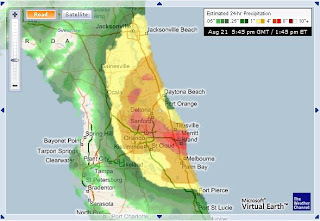 Nevertheless, very heavy rains continue over east-central and northeastern Florida. Later PM Update: As of 5 pm, Fay is meandering northward at only 2 mph; strength remains at 50 mph. Like many anonymous commenters in the blogosphere (and the publishers who harbor them), the storm lacks an inner core, but otherwise it still has a well-defined structure. Because of the slow movement, rainfall continues to be biblically torrential. The official amount of 7.55" observed at Melbourne as of 4 pm crushes the old record for the date of 2.21". A co-op observer in Glades County had received a storm total of 16.17" through this morning. Images: Upper, Doppler radar; lower, estimated 24-hr. precipitation from The Weather Channel. Tropical Storm Fay has now become stationary near Cape Canaveral, Florida, while maintaining its intensity at 50 mph. A slow turn to the north and northwest is still expected by tomorrow. Additional rainfall amounts of 5 to 10 inches are likely over east-central and northeastern Florida with isolated storm totals of as much as 30 inches possible. An unofficial report near Melbourne has reached 22 inches. Many Melbourne area roads have been reported flooded with up to 5 feet of water, although none were officially closed. St. Lucie County schools will remain closed for the rest of the week because of flooding. The Florida State Emergency Operations Team reports that the storm has now affected every county in the state except for the Panhandle. Tropical Storm Fay is drifting slowly along the east coast of Florida this morning. At 11 am, the storm was centered about 15 miles north of Cape Canaveral, moving north at only 3 mph. Maximum winds are still around 50 mph, and the storm has maintained most of its organization; no significant change in strength is expected today. Fay is expected to gradually turn more westward, tracking near route I-10 across northern Florida. The slow movement of the storm is producing very large amounts of rainfall, ranging as high as 21 inches near Melbourne. A Tropical Storm Warning is in effect from Fort Pierce northward to Altahama Sound, Georgia, and a Tropical Storm Watch extends northward from there to the Savannah River. The Hurricane Watch previously in effect has been canceled. Late PM Update: As of 11 pm, Tropical Storm Fay has weakened to maximum winds of 50 mph. After stalling for a few hours this evening, the storm is expected to continue moving north northeast at about 5 mph overnight. The forecast track brings it just offshore, where it could strengthen again, possibly reaching hurricane force before turning back toward a more westerly direction. Later PM Update: Fay is still at 65 mph at 8 pm, and there's an impressive looking eye on both radar and satellite views. Jeff Masters has some comments on the unusual strengthening over land today. PM Update: At 5 pm, Tropical Storm Fay's maximum winds remain at 65 mph as it moves north northeast at 8 mph. A Hurricane Watch has been extended northward to Altahama Sound, Georgia, and a Tropical Storm Watch has been issued north of there to the Savannah River. As Tropical Storm Fay continues northward across the Florida peninsula, it has increased its strength to 65 mph at 2 pm. The storm is moving north northeast at 8 mph from a position near Moore Haven, Florida. Even with a gradual turn toward the north, Fay should move back over the Atlantic near the northern part of the east coast of Florida by tomorrow. This is expected to lead to some restrengthening. Tropical storm winds extend outward up to 115 miles from the center. An unofficial report of 65 mph winds with a gust to 78 mph was received from Moore Haven. 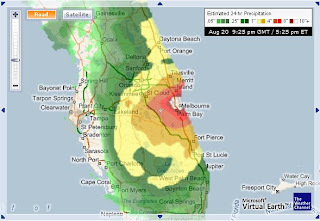 Scroll down to the previous post for the latest Florida radar. Click here for the current Fay podcast. Tropical Storm Fay continues to maintain its strength as it moves north northeast at 9 mph over southern Florida. Maximum winds remain at 60 mph, but slow weakening is expected today. Rainfall amounts from the storm should be 4 to 8 inches, with 10 inch accumulations possible. 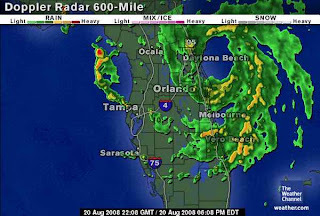 Florida radar from Tampa Tribune. As of 2 am Tuesday, Tropical Storm Fay continues to approach southwestern Florida with no change in strength (maximum winds of 60 mph). The center is 45 miles south of Naples, Florida, moving north at 7 mph. A more north northeast track is expected as Fay approaches landfall later in the morning. At 2 pm today, Tropical Storm Fay was centered about 20 miles southeast of Key West, headed north northwest at 14 mph. Maximum winds remained around 60 mph with tropical storm force winds extending up to 115 miles from the center. Some strengthening is still likely in the next 24 hours. A Hurricane Warning is in effect for the southwestern coast of Florida from Flamingo to Anna Maria Island. A Tropical Storm Warning is in effect from Flamingo around to Cocoa Beach on the east coast. A Tropical Storm Warning and a Hurricane Watch are in effect for the Florida Keys. Showers and thunderstorms from the outer fringes of Tropical Storm Fay are now reaching southern Florida. 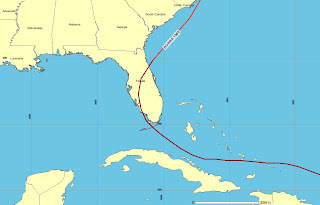 At 11 am, Fay was centered over the Florida Straits, about halfway between Havana and Key West. Maximum winds are 60 mph, and some strengthening is likely in the next 24 hours before the storm reaches the Florida coast. A Hurricane Warning is in effect for the southwestern coast of Florida, and the Tropical Storm Warning has been extended northward to Cocoa Beach on the east coast. See the local links under "Tropical Topics" above for Florida news. Tropical Storm Fay continues on its track south of Cuba this afternoon. Movement is toward the west northwest at a faster rate of 17 mph; a gradual turn toward a more northerly direction is expected. It has strengthened slightly from yesterday to maximum winds of 50 mph. The tropical storm watch for Jamaica has been discontinued. There is still considerable uncertainty in model forecasts of the storm's track and intensity, but strengthening to hurricane force before reaching Florida is likely.